Weaving tapestry is a wonderful way to explore your innate creativity while working with that most versatile and luscious material, yarn. Weaving images with yarn is a wonderful way to tap into the inner artist that exists inside you. Weaving Tapestry on Little Looms is an online class that shows you how to warp and weave on small pegged or slotted looms. I also include a video about warping copper pipe looms and resources about how to make them. This class teaches you about different small looms and how to warp them. We go over how to make headers and the basics of making the shapes all woven images are composed of. We look at different projects and I offer inspiration from small-format tapestry weavers. You can see the entire course contents below. If you have questions, please do contact me! 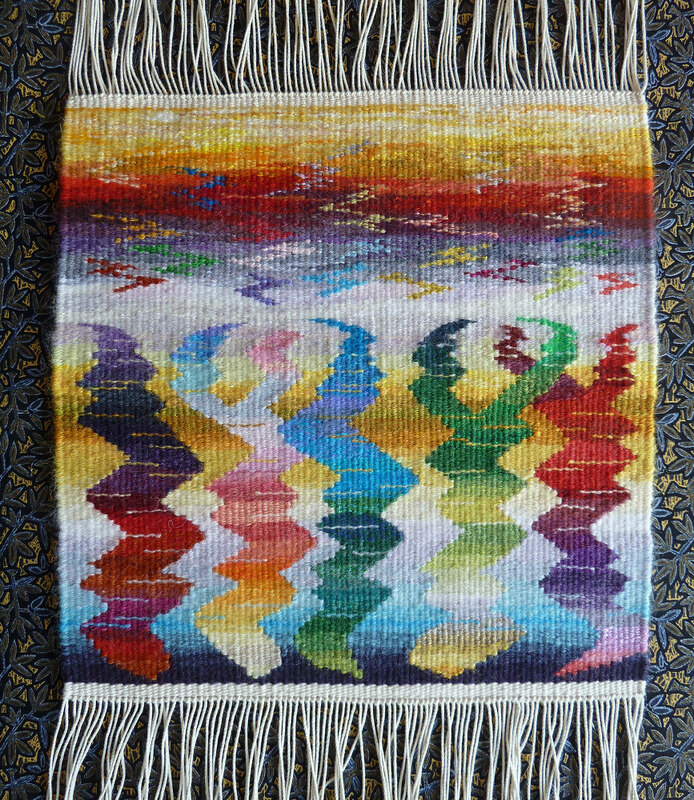 This course addresses tapestry weaving from a traditional techniques perspective. Our goal is to make images in weaving, constructing the ground cloth as we weave the image. Tapestry weaving has existed for tens of thousands of years and there are some basic rules that are important when constructing a textile in this way. I'll teach you the foundations of tapestry weaving and get you started on a life-long exploration of expression through yarn. And if you've already flown down the tapestry rabbit-hole, please do still join us for this class. There is much for even an intermediate tapestry weaver to experience here. Thought the course was great! Organization was the key. . . I can go back any time to improve. Thumbs up. Weaving speak and terms like sett, epi, and warp sizes were clearly explained. So we can now all talk the same language. Yay! These are the steps included in the course. READ steps include printable handouts. WATCH steps are videos. Numbers in parenthesis are times of the videos. Why pick a particular header? READ So you want a fast start? Let's see what you made! This section contains surprise bonuses and trainings. You'll see them when you register! This video was made in November 2017, thus the holiday theme. It shows a small slice of the work that was done in this course during the first year it was live. I am just so thrilled to have found Rebecca Mezoff’s course - it has been a real joy for me. Weaving Tapestry on Little Looms is $129. That includes forever access and the secret Facebook group where you can ask questions of me and interact with hundreds of other weavers also in my online classes. Please contact me with any questions HERE. Come join the fun! Register. I LOVED this course! What a kind and careful and encouraging teacher Rebecca is! The best sort - really! I started out as a total beginner: not “crafty,” no “textile arts” experience at all at age 67. I got the idea of weaving from three recent experiences: my granddaughters’ small tapestries from a summer arts program, an excerpt from a memoir that inspired me, and then seeing that I could start “small” with your course. I now have four small looms (one will be given away - don’t like it) and have found joy in simply sitting and working with my hands and all that beautiful color. I am not a natural at this - and don’t expect to be - but I’ve found something that I will enjoy for a long time. It’s wonderful to have a learning curve again after retirement! It feels great to learn new things and be surrounded by such a warm and supportive group of weavers. My take-away from this course is mainly that yes: I CAN learn things I thought were beyond me - if I keep at it. The resources in this course are outstanding and of highest quality. I learned a lot from each video and really appreciated the back-up documents, which gave details and reinforced the visual instructions. The discussion board offered up my own questions many times, and I found each q and a to enrich my own understanding of weaving approaches and avoidable pitfalls. My final take-away - for weaving and for life itself: experiment and learn from mistakes! I learned the most from seeing my mistakes, pulling out the weft, and trying again. Right now, I can point out many aspects of my posted tapestry that could be improved, but I’ll work on those things as I go forward. Also, I haven’t mastered splicing and I sure intend to! My next step is to take Rebecca’s warp and weft class and, after that, the color gradation course. I know that working with color is something I want to immerse myself in once I am more proficient with the basic skills.